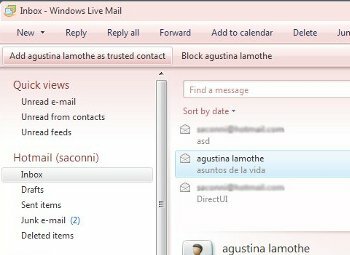 Microsoft tm decided some time ago to include their free email client inside Live technologies tm. Many customers asked us to develop a library for Microsoft Live Mail tm with the same features the our product OEAPI has. We have done important research in this area and we are now offering Windows Live Mail Plugin API to develop plug-ins for this email client. The add-ins are able to create toolbars, interact with the storage, get the selected message and folder, etc. Most of the features that are present in OEAPI can be done in Windows Live Mail tm. We are now offering WLMailApi, a library implementing a similar functionality that OEAPI has for Outlook Express and Windows Mail. WLMail lacks of any public interface, even the public interfaces IStoreNamespace and IStoreFolder were removed. You can also contract Nektra to develop your plug-in in our service page Windows Live Mail Plugin Development. This screenshot shows a sample anti-spam software that has a toolbar that is able to get message list information.